Stradivari "le messie" — Gamut Music. Inc. The Salabue Stradivari, "le Messie"
There are many surviving instruments from the Stradivari workshop that can be used to as a model as well as molds and drawings that a modern maker can copy. In fact there is so much information available about Stradivari’s instruments it is difficult to decide which part of the surviving body of data to use. For my Stradivari model, I have chosen one of his most famous instruments, the violin made in 1716 known as the “Messiah”, or, in French, “Le Messie”. The instrument was given this name by accident one day in the mid 1800s by the famous violinist Jean Delphin Alard when, after hearing Luigi Tarisio expound upon but not show the violin, he exclaimed that this instrument was like the Messiah in that it was always expected but never arrived. The violin is singular in that according to legend Stradivari kept it until his death in 1737 when it passed into the hands of collectors ending up in its current situation in the Hill collection on display in the Ashmolean Museum in Oxford, England and therefore has never been played as a working instrument. In 1973 I had a rare opportunity to examine and measure this most prized of musical instruments when I applied to the Ashmolean Museum to allow me to examine two examples in the collection: the Amati tenor viola and the 3/4 size decorated violin by Antonio Stradivari. When I was led to a table in the basement where the instruments were waiting for me, I found that, by mistake, instead of the small decorated violin, they had brought the “Messiah” violin for me to look at. There seemed no point in correcting the mistake, so I spent a pleasant day taking the measurements and drawings from this famous and elusive instrument. I offer this instrument in the baroque setup as pictured, or with modern fittings. 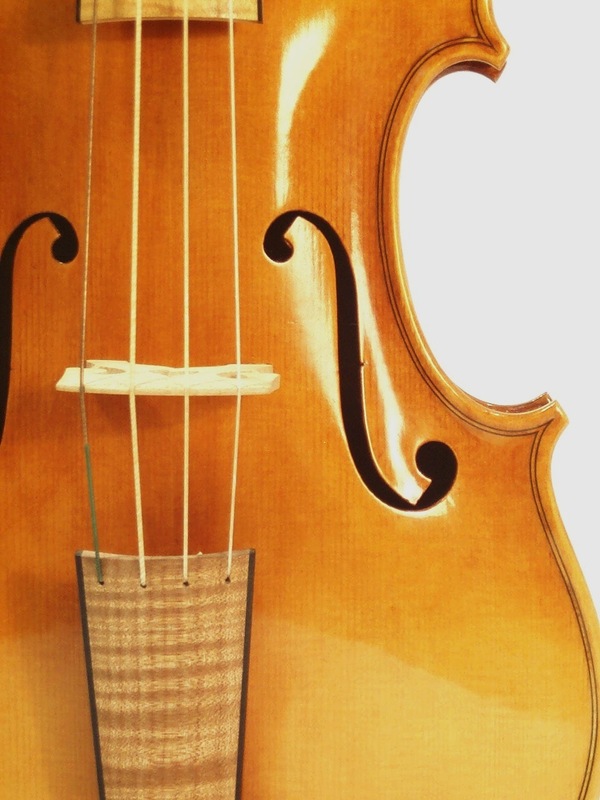 This instrument offers a unique opportunity as a baroque violin. When Vuillaume did the modern conversion he chose not to cut off the original neck but rather built up the heel of the neck. The exact dimensions of Stradivari's neck are easy to see. All instruments are made with the finest materials. The varnish ground is a mineral undercoat as used in Cremona in the 16th c and 17th c. The instrument is colored with a madder lake wash. The varnish is made in this shop with amber resin according to a traditional formula.